We were cord cutters before there was even a phrase for it, so I don't watch a whole lot of home shows. I've always found mid-century blogs more relevant and helpful anyways. We've taken a few vacations lately and ended up somewhere with cable a few times. I binged on home and home improvement shows and it seems they all have same similar themes: contemporary suburban (young couple moving out of the city to start a family) or modern down-sizers (empty nesters moving back into the city and not totally comfortable with it). But, on the few occasions they do talk about mid-century or mid-century modern design, the shows seem to get it more right than wrong these days. Which isn't too surprising, it is much more fashionable than the last time I had cable. HGTV has a decent intro-level guide for adding mid-century modern style to your home. The only thing they really got wrong is the wall colors (suggesting white). 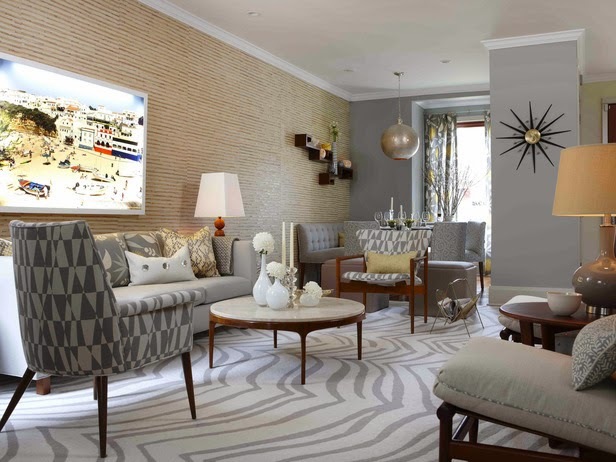 Gray is the way to if you want simple, clean mid-century interior colors. When I built the tiny secondary suite I live in now, I chose white for my walls in order to make the rooms appear as large and bright as possible, but I picked a white that is very, very gray. When the light hits it just right, it actually looks gray.